A Lunar Corona is a most beautiful meteorological effect, and is best seen when the bright moon, around its FULL phase, is high in the sky; so the full moons of winter offer the best opportunity. Coronae are often seen when the Moon shines through alto-cumulus clouds, often referred to as 'Mackerel Sky',(because the collection of small cloudlets are reminicent of a shoal of fish!) but can be seen through much higher thin, almost transparent clouds. The effect is of a colourful number of concentric coloured rings, a 'Bull's-eye' surrounding and touching the Moon's disc. 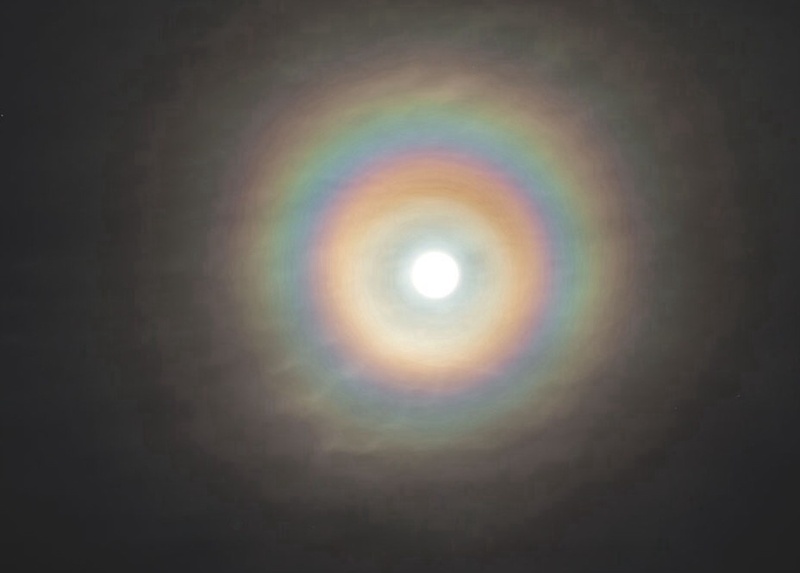 Coronae of this nature are produced by light defraction produced by small water droplets or sometimes by tiny ice crystals in clouds, the more uniform the size of the droplets or crystals are the cleared the coronae seem to be. 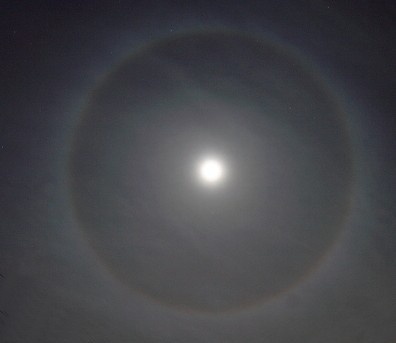 A Lunar Halo is quite different, and consists of a discrete ring or 'halo' some distance away from the moon. They occur usually when the Moon is shining through Cirro- Stratus clouds. Cirro-stratus clouds are often the heralds of weather fronts which frequently bring rain. As with lunar coronae, they are best seen around the time of Full Moons during the Winter months. (Erasmus Darwin, from poem: 'Signs of Rain.'). 'A halo around the Moon is a sign of wind'. Sailors beware! the driving gale is near. Serene the air, and smooth the tranquil sea. And furious tempests follow triple rings.